August 11, 2013 in Lisa Monti. The Find: Bay Life’s got Baggallinis! Oh, sweet! Eleanor Jean “Shu Shu” Larroux (Prescott)! Shu-shu is what daddy used to call a firecracker that fizzled and died…never exploded. Nice! Shu Shu is sweet. 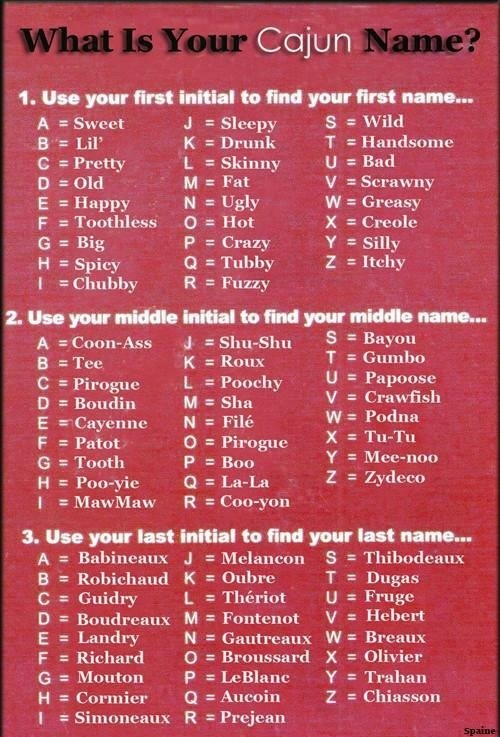 I’m Skinny Coonass Fontenot. Can it get much better than that? Sleepy Gumbo LeBlanc is my legal moniker (Jean Town Prescott). But my maiden name is Happy Shu Shu Theriot. Skinny Coonass Fontenot sounds like someone with whom I would not want to mess, and that’s probably a good thing. Sleepy Gumbo and Happy Shu Shu sound like wusses.